This is my Dramcember review for the year and quite pleased by what I chose: Bruichladdich Waves. There is always a risk buying a bottle of something you have never had before but it is the whole reason behind Dramcember, and that is to pick something you have never had, try it, and then write about it. 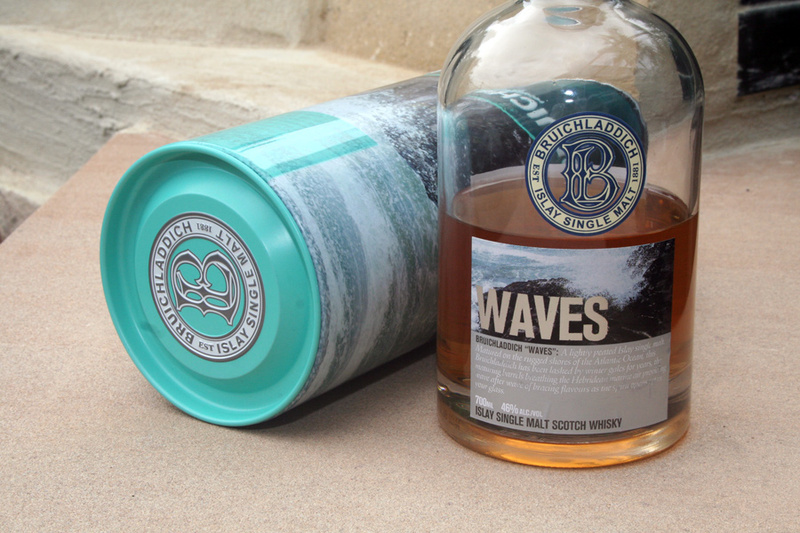 Bruichladdich Waves is certainly a whisky to try. First dram impressions young and fresh but with complexity. Fruits and sweet smoke laced with sea salts. A single malt whisky at 46% ABV, moderately peated at 15 ppm, and part of the series release by Bruichladdich which includes: Waves, Rocks, Peat. On the nose Salts, fruits, mints and peat smoke. Alcohol is a wee bit strong but not unpleasant. Typical Bruichladdich sea air lightness but you can tell instantly there is Octomore (which I adore) in it by the smell alone. On the pallet lots of body, fruits, citrus tangs and mild sweet peat which leaves heat on the gums and tongue. The finish is relatively short which really encourages it to be drunk pre-dinner. Balance is quite good if your looking for a bit of a spike in your whisky. When should you drink it? Well it took me an hour of appreciation to completly appreciate the first dram and after that around 20 min to 30 min for the remaining. Certainly a pre dinner to main course seafood accompaniment. I suspect this would go really well with ocean flushed oysters (Cloudy Bay if your in Tasmania) and or chilled prawns. Very clean and light. If I was to give a dram then it would be 5 1/4 out of 7. A whisky to nose, taste and enjoy for what it is. In a bit of research I have found that the contents of Waves is a combination of 5 different Single Malts aged in Bourbon and Madeira casks. These include Bruichladdich Octomore to Bruichladdich Port Charlotte. "What are you talking about Baron" you might say, "how can that be a single malt when the malts are blended?". Well to ensure you understand a single malt whisky not only is a whisky made from only one type of malted grain but it must also be distilled at only one particular distillery before going into the barrel. Because it is all from the same grain and same distillery it is still a classed as a single malt and NOT a pure malt/vatted malt. Regardless of it's contents if you like the hit of Octomore then Waves will take you back to that experience in a subtle way. On a not so pleasant note I have found the whisky to diminish quickly in the bottle after opening and has developed quite an odd cloudy sediment in the bottom. At first I thought I was seeing things but a closer inspection confirmed my suspicions and if you tip the bottle on its side and look in the bottom there is a sludge like effect occurring. A quick google and I have found a couple of other individuals experiencing the same thing. Drink it quick is the best solution and I aim to. Keep on Dramming and be sure to contribute to Dramcember.